A dental office is a busy place. Patients are going in and out of exam rooms: Dentists, hygienists, and assistants are buzzing from one patient to the next. This constant movement, along with the design of the dental exam rooms can pose a problem for many dental offices when it comes time to plan for proper medical waste management. Understanding where medical waste disposal containers should be placed is key to the safety of staff and patients alike. Knowing what to and what not to dispose of in a medical waste receptacle is key to lowering disposal costs. One of the reasons people fear going to the dentist is due to their fear of needles. 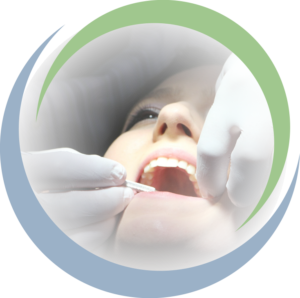 Sharps are used on a regular basis in dental offices for a variety of reasons. Many times, needles are used for local anesthetic purposes or to draw blood from a patient who may be undergoing oral surgery. Because of the potential risks associated with sharps, they should always be placed in a clearly labeled sharps container. Wellbeing Midwest provides red biohazard sharps containers that are puncture resistant and leak proof. Not only does this help keep your staff safe, but it also prevents accidents, protects your patients, and helps make the overall medical waste pickup and removal easier. There are many dental treatments resulting in blood soaked products such as gauze. Blood soaked gauze is a bio-hazardous material that may also be considered a bloodborne pathological waste product. These blood-soaked products should be thrown away in a designated area such as a leak proof and puncture resistant red biohazard bag or a clearly marked biohazard container. We can help you decide what size red waste container you will need based on the flow of your business. This will help your practice stay compliant and save you money in the long run. Since mercury amalgams (material used in fillings) contain mercury, they must never be thrown in the trash, down the drain, or even in a red medical waste container. In fact, there are specific regulations surrounding the disposal of this highly toxic element such as using amalgam separators to catch as much mercury as possible. In addition to mercury, there are still some dental practices which have to worry about silver waste. If your practice hasn’t been able to upgrade to digital x-ray technology, then chances are high that silver fixer is still being used. Silver fixer should never be washed down the drain. Silver waste product can be collected and disposed of by a professional biomedical waste company. If your practice uses any products containing lead such as lead aprons, then it is very important to dispose of the lead products properly when needed. We can work with your staff to provide proper biomedical waste disposal training and biomedical waste solutions for your overall practice. Many chemicals and sterilization products used in dental offices can be harmful to the environment, your staff, and your patients. Since some chemicals are considered hazardous, learn as much as you can and follow all federal guidelines and regulations. If you have questions regarding the types of chemicals used in your practice and want to know how to dispose of them properly, contact us! Our team is here to help when you need it. Whether you are a dentist office in Overland Park, or Lawrence, an Urgent Care Clinic in the Northland or a vet clinic in the heart of Kansas City, Wellbeing Midwest can help you create a biomedical waste plan that will save you time, money, and a little sanity when it comes to dealing with state and federal regulated medical waste disposal. Do you have a trusted company for biomedical waste pick-up and disposal? One that promises no hidden fees and provides education throughout the partnership? If not, give us a call at 913-685-4183 or shoot us a message and our biomedical waste disposal process and biomedical waste management services.